The charges were laid the day after an altercation at the Milton Cato Memorial Hospital, between Dominguezâs lawyer Bayliss Frederick and police officers. Dominguez had been a patient there, nursing gunshot wounds. 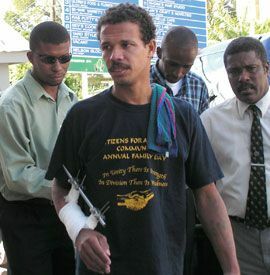 When Dominguez appeared before Coroner Stephen Huggins at the Kingstown Magistrateâs Court on Wednesday, he was not required to enter a plea until yesterday when the matter was supposed to go before Senior Magistrate Donald Browne. Acting on behalf of Dominguez, Frederick told the court that the magistrate had already struck out the case against his client after the prosecution informed the court that there was no case against him. âThe court has to exercise its jurisdiction today in determining if the prosecution has the right to proceed with the charges of Mr. Dominguez,â Associate of the Frederickâs attorneys, Shiraz Aziz urged Huggins on Wednesday.